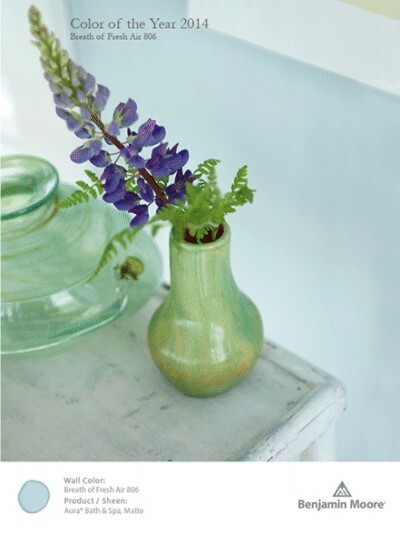 Recently, Benjamin Moore released its latest color of the year for 2014, “Breath of Fresh Air,” a light, tranquil blue used as a neutral base. The conceptual thought process for their new palette is based on the idea of looking to nature for neutral colors, such as this case of blue shades of water and the sky. Take a look around outside and you may find combinations of not only colors, but of various elements that inspire a sense of calm and harmony within you. Now imagine bringing that zenful feeling into your home through the use of color, textiles and accents. Breath of Fresh Air 806 is a color that can be used throughout your entire home to help create that sense of flowing harmony. The color reacts well with natural light and creates a feeling of being light and clean, a welcome outlook in kitchen design. When used in a bathroom, the feeling may be closer to that of being at a spa resort; a luxurious calm. Whether your decorating style is masculine or feminine, Benjamin Moore’s 2014 Color Trends palette has 23 color hues that have been created to harmonize and complement one another. Click here to view the full color palette. Please note, colors onscreen may not be a true representation of the actual color and are for visual reference only. Visit one of our locations in person to see swatches. Color has such an impact on daily life that it makes perfect sense to transform your living space into one that allows the energy of your home to flow freely and harmoniously for you. Our professional designers are experts in designing with color and are here to help assist you in your design journey, from beginning to end. Kitchen Views, where the designers are pros, and the views are yours! National Lumber is a Benjamin Moore Paints dealer with showrooms in six (6) locations. Visit our experts for advice and all your painting supplies. See BenjaminMooreExperts.com for more ideas and product information.